Why a pouring old game of ping pong when you can put your foot on the gas and play an experiential Smart car game! 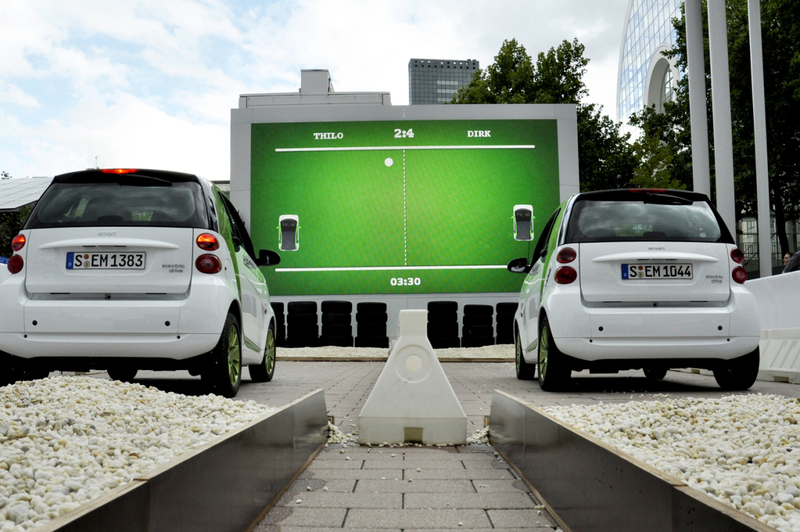 Smart is a German automotive marque and division of Daimler AG, based in Böblingen, Daimler promoted the third generation Smart For Two electric drive car at the Frankfurt Motor Show (IAA) with eBall, an interactive game event using Smart cars to play a digital game of Ping Pong. The interactive event was designed to demonstrate the joy of driving a highly responsive car. Visitors were invited to sign in with their driver’s license, and given instructions on forward and reverse before engaging in a live duel using laser measurement technology. The campaign was extended with print, outdoor and guerilla elements on a experiential marketing tour. The experiential marketing campaign won Gold for Interactive (Physical Innovation) at the 91st ADC Awards.